The procurement of defense equipment, and the upgraded and renewed domestic market, will stimulate the shipbuilding, aerospace, and information industries as well as manufacturers in peripheral fields such as machinery, materials, and electrical apparatus to become involved in state-of-the-art R&D. This will achieve the goal of technological innovation and help manufacturers to grow. 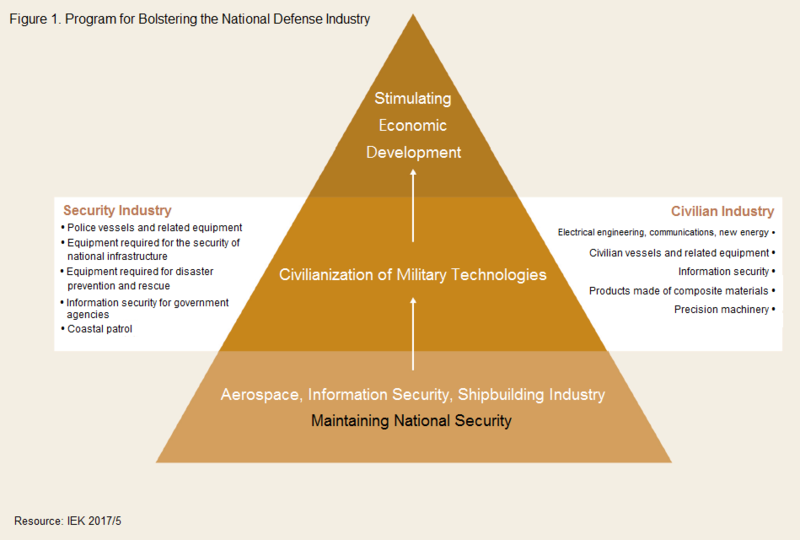 To facilitate collaboration among Taiwanese and international companies in the national defense industry and help companies develop the industry in Taiwan, the Ministry of National Defense has tapped into the resources of the Ministry of Economic Affairs and the Ministry of Science and Technology to promote the national defense industry. Aerospace industry clusters are being established in Taichung, Tainan, and the National Chung-Shan Institute of Science & Technology in Taoyuan. Naval shipbuilding clusters are being established in Kaohsiung, Pingtung, and Yilan. Information security clusters are being established in Taipei and Hsinchu. The government is actively planning the "Program for Bolstering the National Defense Industry" and the fifth-phase national information security development program. Through the manufacturing, procurement, and upgrading of defense weaponry and equipment, these programs will drive the development of technologies and supply chains in the civilian aerospace, shipbuilding, and information security industries. In 2017, the gross product of Taiwan's aerospace industry was over 3 billion USD. Taiwan has established itself in the global manufacturing and maintenance supply chain in the fields of engine casing, turbine blades, aircraft fasteners, composite material structures, air cargo containers, cockpit instrument panels, and the conversion of passenger airliners to cargo aircraft. 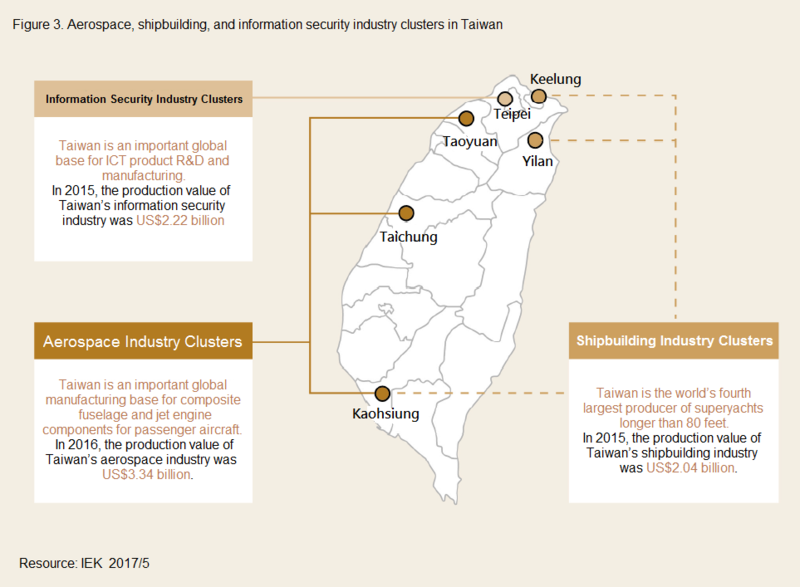 Taiwan's shipbuilding industry has a diverse range of commercial shipbuilding capabilities. In 2017, Taiwan ranked fourth globally in the number of superyacht orders. CSBC Corporation is the largest shipbuilder in Taiwan, with the world's fourth-largest million-ton dry dock. Taiwan's information security professionals have performed exceptionally well in international information security competitions, proving that the country has capability for advanced information security work. 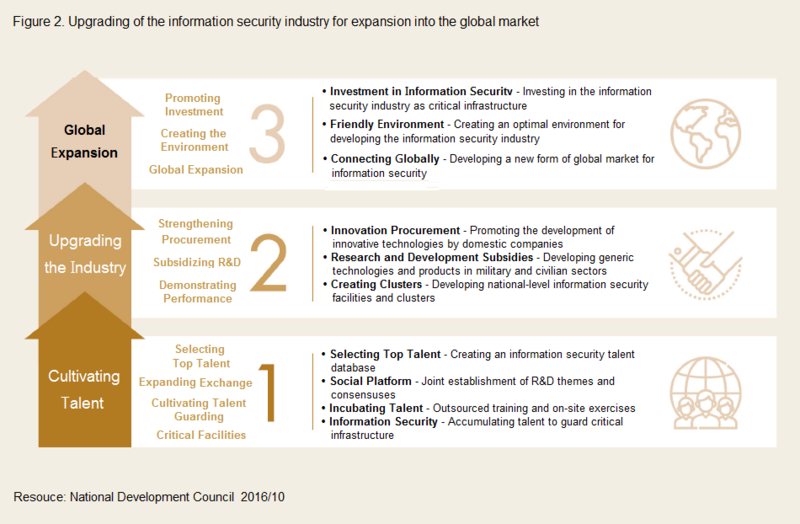 This capability, combined with Taiwan's ICT supply chain advantages, is instrumental in developing innovative information security products and emerging services. Based on its existing defense industry, Taiwan welcomes international research institutes, companies, and investors in the field of defense to collaborate with Taiwanese companies in developing defense products, information security software and systems, and industrial services so as to seize business opportunities in Taiwan's industrial development. Through its "indigenous fighter plane" program and aerospace industry development policy, Taiwan will continue to drive growth in the civil aviation industry. 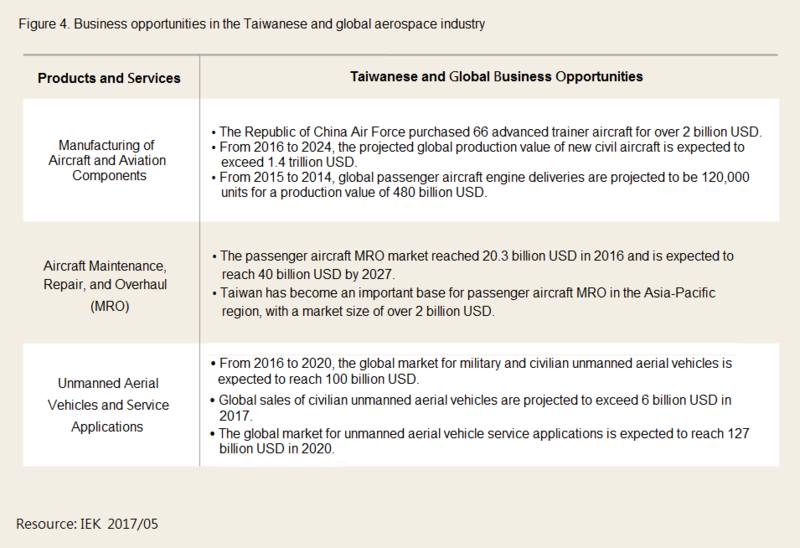 It is expected that within 20 years, Taiwan will establish itself as a key player in the fields of aerospace component manufacturing and aircraft maintenance in the Asia-Pacific region. Specific investment opportunities include advanced aviation manufacturing technologies and equipment, composite material technologies and equipment, maintenance, repair, and overhaul(MRO) technologies and base operation, aviation schools, unmanned aerial vehicle development and manufacturing, and innovative applications and services. The Navy and Coast Guard Administration will have a demand for 7 billion USD new vessels over the next 20 years. Combined with future demand for new submarines and offshore wind farms, with the addition of over 2 billion USD in annual production value for the shipbuilding industry, it is projected that Taiwan's business opportunities in the shipbuilding industry will exceed 3.3 billion USD annually. Specific investment opportunities include advanced nautical technologies and equipment, development and manufacturing of marine propulsion systems and components, development and manufacturing of nautical electronic systems, development and manufacturing of unmanned surface and underwater vehicles, and innovative applications and services. Taiwan encourages overseas and domestic companies to engage in joint-investment in developing advanced information security technologies and solutions, and to cooperate in field testing in the Internet of Things and the cloud environment (e.g. Smart Cities, critical infrastructure) to accelerate the development of information security products. It is projected that by 2020, the production value of Taiwan's information security industry will reach 1.6 billion USD. (5) For operators stationed in Export Processing Zones, Science Parks and Free Trade Zones, import duty, commodity tax, and sales tax can be exempted on imported raw materials, fuel, materials, semi-processed goods, and machinery. The business tax rate in such areas is zero on goods and services shipped abroad. (4) Industrial Upgrading and Innovation Program: For companies having R&D teams in Taiwan, subsidies are available for 40%-50% of project funding for projects that conform to government programs and up to 40% of project funding projects generated by the applicants themselves. The French company Airbus provides repair service and training in cooperation with China Airlines, and the American company GE co-founded an engine repair company with Evergreen Aviation Technologies to offer services to clients in the Asia-Pacific region.